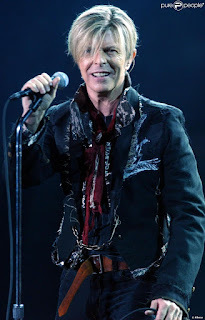 Last night, I dreamt about David Bowie and we had a very interesting conversation. As this dream was in English, so is this post. Sorry for les fâchés avec la langue de Shakespeare. I met him whilst walking along a street sided by tall trees. David was sitting on a bench with his bike aside. He laughed, passing his hand in his hair. He was wearing a simple beige jacket, a white shirt and a thin black tie that was a bit untied. Very casual, at ease. We shook hands. We walked together and we chatted. As my memory is fading, I cannot remember exactly what we talked about, something about fame and walking your personal path. I just remember a very important sentence. As we arrived to the house he rent (we were in a small village of the South of France like Ramatuelle or something like that), he was taking care of his young daughter (was she 4? or 5?) riding a wooden bike. We were talking about moving on, moving forward, having a new goal. He looked at me, like waiting for my reaction. I was amazed by what he was saying. - I mean, not right now, he continued. I am still reinventing myself, and I don't know what will be the next David. My memory fades and that is all I can remember.